This fancy birdbath is a two-piece pole bath with a step in leg that helps to insert it easily into the ground. 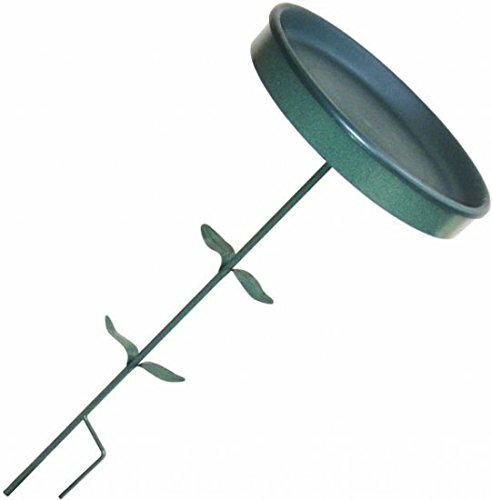 17 inch diameter dish with the perfect 1-1/4 inch - a proven depth that birds love to bathe in! The Pole elevates the bath a great 33 inches above ground. Verdigris special design Green Metal Ring with Plastic 17 inch Green Insert. Fancy green leaves on pole to make fit your garden decorations - ideal for outdoors. It's also a fantastic seed tray because of it's elegance, it's depth, and it's height. Dish and stand are both made in the USA. Replacement dishes are available. Elegant -- perfect for the outdoors and easy to mount. View More In Birdbaths & Supports. If you have any questions about this product by Erva, contact us by completing and submitting the form below. If you are looking for a specif part number, please include it with your message.